Background: Aldehydes were converted to carboxylic acids using sodium hypochlorite as oxidant in a single step, involving microwave assistance and without a metal catalyst in basic media. The use of microwave irradiation increased both conversion and yield due to an easier work-up and the reaction time was reduced. Two advantages of this oxidation are the relatively low cost and low pollution. This oxidative method has been applied to alcohols successfully. Results: Several aryl aldehydes and alcohols containing different substituents were oxidized with moderate to excellent synthetic yields. The effects of various substituents on the aromatic nucleus were examined, finding that not only the nature of the substituent is important but also its position. Microwave irradiation was favorable and considerably reduced the reaction time. 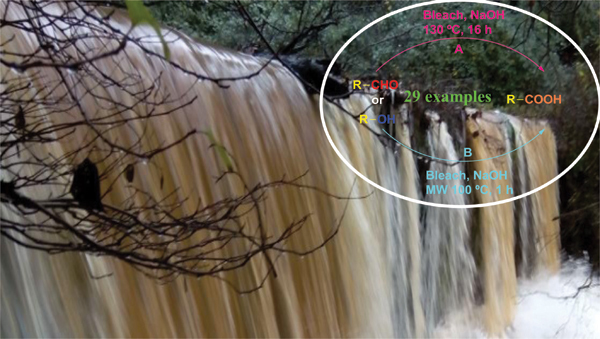 Conclusion: A simple and effective preparation of carboxylic acids from the corresponding aldehydes or alcohols in basic media was successfully achieved with inexpensive domestic beach. Oxidation, aldehydes, alcohols, microwave irradiation, carboxylic acids, hypochlorite sodium, bleach.